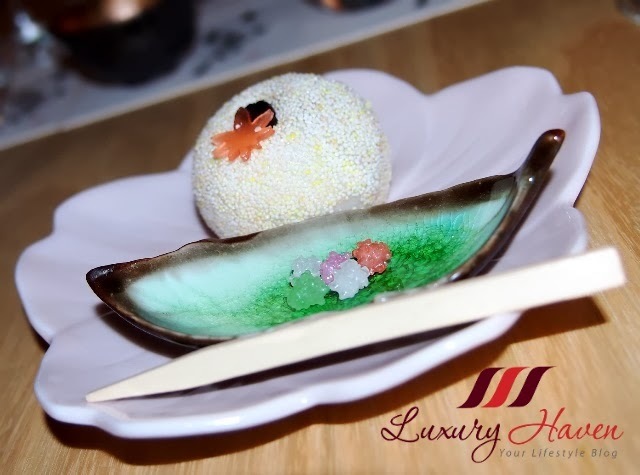 If you haven’t stepped into Hashi before, you’ll be amazed by their flamboyant decor; it’s nothing like any other Japanese restaurant you’ve visited. Clad in gold, wood & kimono-style furnishings, their interior will sweep you off your feet, not to mention their cuisine. Born & raised in Tokyo, Chef Tadashi began his career working at Kaiseki Komuro restaurant, where he mastered the art of #kaiseki dining under acclaimed Japanese kaiseki chef Mitsuhiro Komuro. 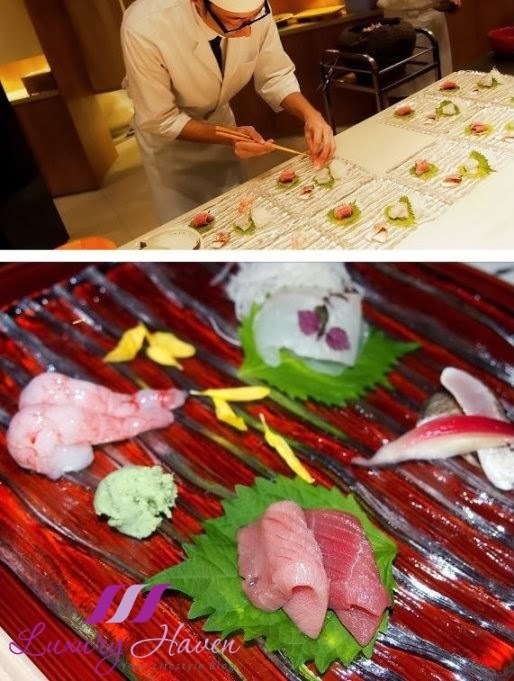 In 2004, Chef Tadashi crossed the globe to work at Michelin-starred Umu restaurant & Nobu in London where he perfected his techniques to move traditional Japanese cuisine into the modern age. He subsequently led the Nobu team in Melbourne before reaching our shores three years ago. The aroma from the truffle was enough to blow me away with their Homemade Egg Tofu with Vegetables & Boiled Prawns with Truffle Sauce (卵豆腐と冷たい野菜、海老のトリフソースかげ). Dig into the silky smooth tofu, you’ll be overwhelmed by the accompanying truffle sauce with each spoonful of tofu in your mouth. Guests that evening were fed with 4 Types of Seasonal Sashimi (季節のお刺身４点盛り). My pick has got to be the melt-in-your-mouth Tuna #Sashimi! Hubby & I love tuna sashimi. What’s your favourite raw fish? 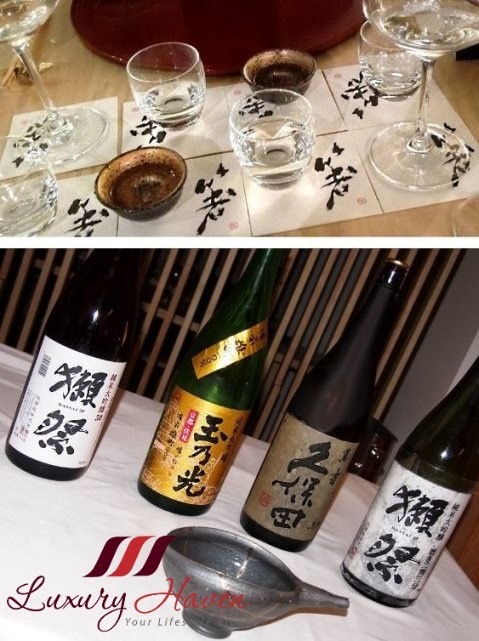 The above starters were paired with Sake Dassai 50 from Yamaguchi (獺祭, 山口 - 純米大吟醸５０). If you like the smell of Yuzu, you’ll certainly enjoy the White fish with Japanese Ginkgo Nut Soup (銀杏のすり流れと白身魚). 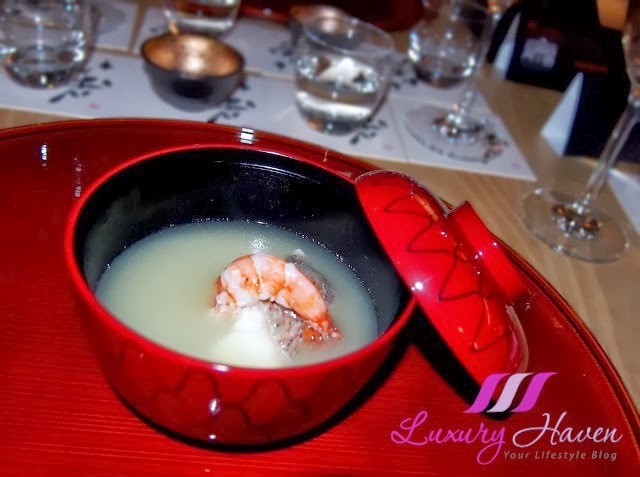 The soup was mildly scented with Yuzu Zest, & I love the starchy consistency of the broth arising from the ginkgo nuts. Refined technique was displayed in the next dish, a magnificent savoury meat with intense flavour & texture. 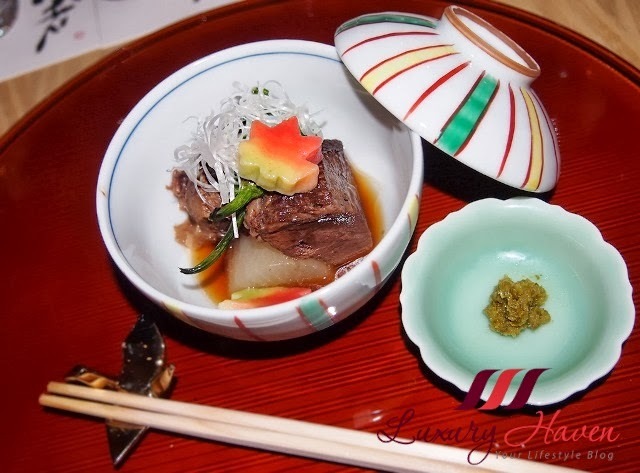 Beef cheek is not commonly used in Japanese cooking, but because Chef Takahashi adores that part of the meat, he decided to implement it in his cuisine. The aesthetically appealing dish was decorated with maples leaves made from gluten, signifying the change in the seasons. 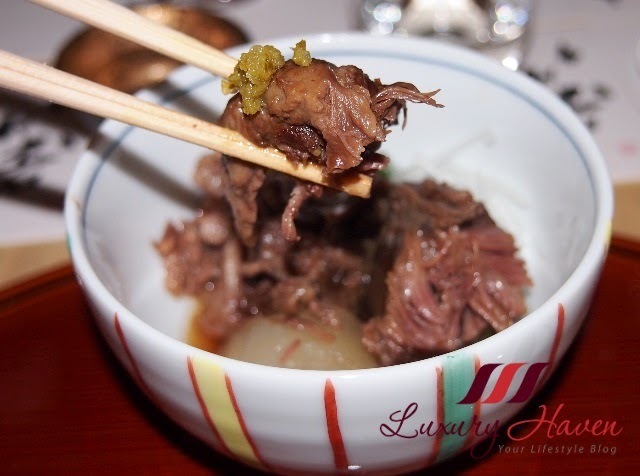 The Japanese-style Slow Cooked Beef Cheek with White Radish (牛のほほ肉と大根) was such a hit that evening that it had an unanimous vote from the diners, making it the “talk of the town”. The cooking technique was as precise as a Swiss watch, & it was one of the best I’ve ever eaten even though I had an overdose of beef cheeks due to its popularity in recent years. Interestingly, there was a special concocted Japanese Chili "Yuzu Kosho" (柚子胡椒) to go along with the dish. The chilli was just as delicious, but surprisingly spicy. The beef cheek wasn't like any I’ve tried where the sauces were usually thick n rich. Hashi's version was very much lighter, but packed a punch. I’m not sure if it’s in their Ala Carte menu already, but you just gotten try this 5-star dish! Next on our menu were 5 types of Chef’s Choice Seasonal Sushi (江戸前寿司５貫), paired with Sake Dassai 23 from Yamaguchi (獺祭, 山口). 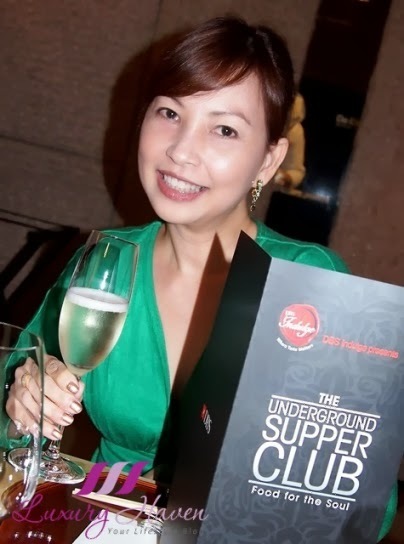 What I enjoy about these Underground Supperclubs is that foodies get a chance to mingle with the Chefs. 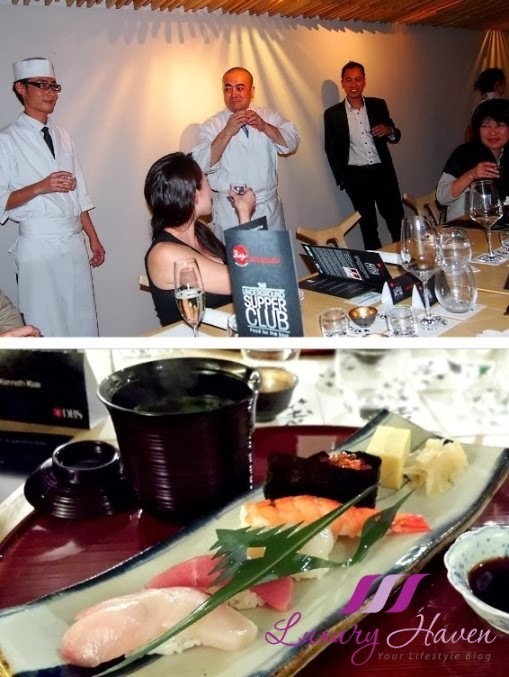 Like this instance, Chef Takahashi would make his appearance in between courses to introduce his creations. If time permits, diners would also get to learn more about the chefs themselves. Don’t you think it’s like a playground for foodies to gather & mingle as well? We’ve come to the end of our last course which was a Traditional Japanese Dessert from the 5th generation shop “Ganyuudo” in Shizuoka (和菓子 - 巌邑堂 静岡). Chef Takahashi will introduce these Japanese sweets, handcrafted by fifth-generation pastry Chef Hiromori Uchida & shipped over from his shop to Hashi on a weekly basis. 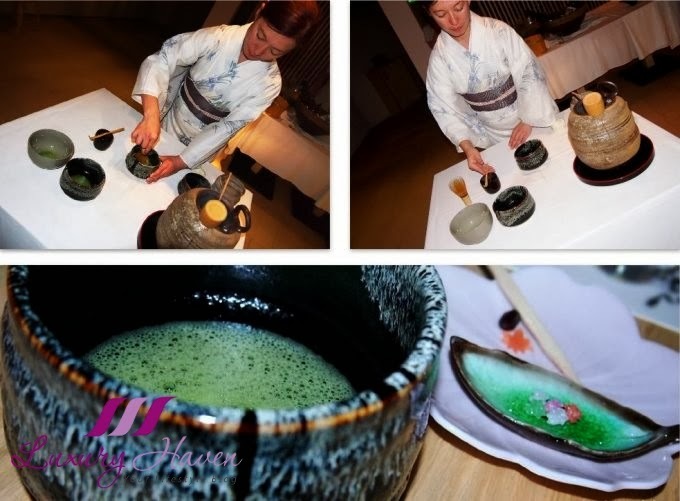 The beautiful #wagashi was paired with “Maccha” green tea, whereby there was a special corner set up for the simple tea ceremony. 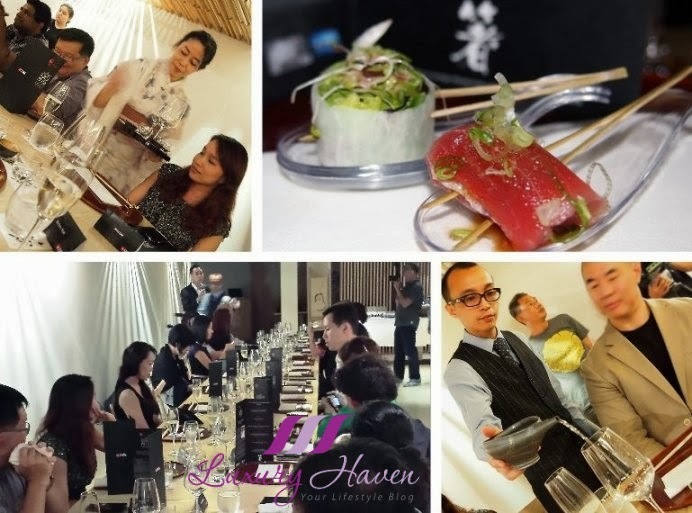 Whether it's for a lavish event or an intimate gathering, the restaurant offers a unique Japanese dining experience for all. 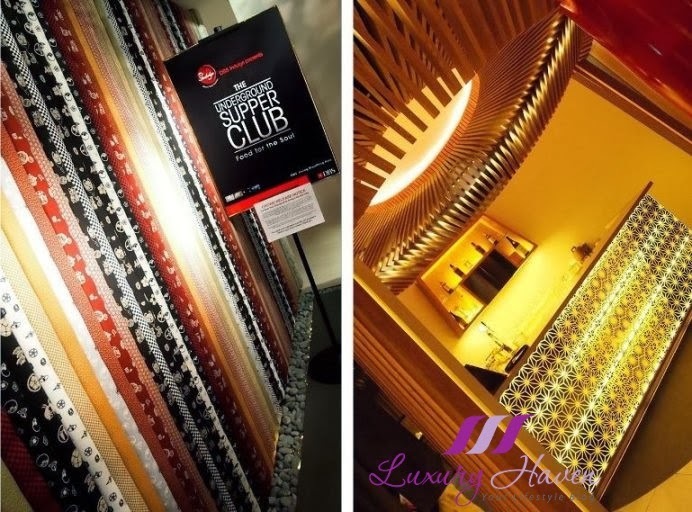 Contemporary & stylishly designed, the restaurant houses a luxurious main dining area, private rooms, dedicated sake bar & an exclusive sushi counter. Thank you DBS & Asian Food Channel, for the invitation! Very fine dinning indeed! Looks like you had have a good time that night. I love how the foods are presented with small edible deco like the maple leaf make from gluten, and the jelly like flower design on the dessert. Nice! DS, it's a great bonding session for hubby & I. Hahaha! Yah, love the food presentation! World class dining palate. Every dish is beautifully platted and really, its about awesomeness. Sharon, hahaha! Thanks for your sweet note! Classy. Those sashimi looks awesome too! Wow Shirley, what a nice treat...everything looks so elegant and perfect. I always enjoy Japanese cuisine. Yummy sashimi! I feel like I just read a delicious dream. Such wonderful presentations and elegant fare. 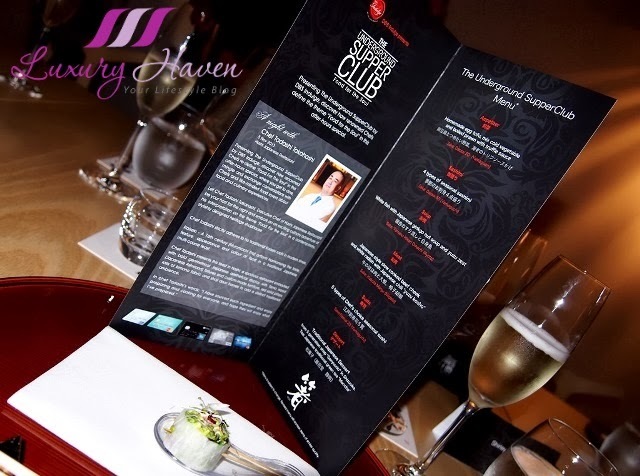 High Society, lol...It must have been so exciting to mingle with the Chef and listen to how he plans his meals. Every single dish looks beckoning. You and your husband are a stunning couple:) Thank you so much for "inviting" us to this underground dinner. First of all, Nice logo (those watermark on your photo). Edmend, thanks! I like it too ^_^. Professional look. Serious reviewer on the prowl. Lol. You look great. Kathy, you're real cute! Thanks, dear! The food is just gorgeous, Shirley...I'm sure it was a heavenly experience! And you look smashing in green!! superb, i would love to enjoy all the food there. cquek, hahaha! Dont mind eating there again, especially the beef cheek! The foods were perfectly prepared and presented makes me wondering how much it would cost. But anyway, I can see that you and your husband enjoy the dinner. You are indeed looking very elegant, beautiful and gorgeous in that dress. DD, it's a good deal if you're a DBS cardmember like those guests. Thanks, sweetie! I have never had sushi think I must give it a try soon. They have presented the dishes very well. Love the color of your top. Subha, oh really? You must try some day then. Thanks & have a good weekend, dear! Shirley, what a fantastic dining experience! I don't know which I enjoyed more -- your review, your photos, or the fact that you can truly "appreciate" food that's done right. (I was enjoying it right along with you -- especially that tuna sashimi!) This truly must have been a memorable evening for you and your hubby. Pepper, lol! Pay attention to the food please! Hahaha! The food presentation looks fantastic and very nice. It got me drooling. The word Michelin is definitely above 5-Star standards here! 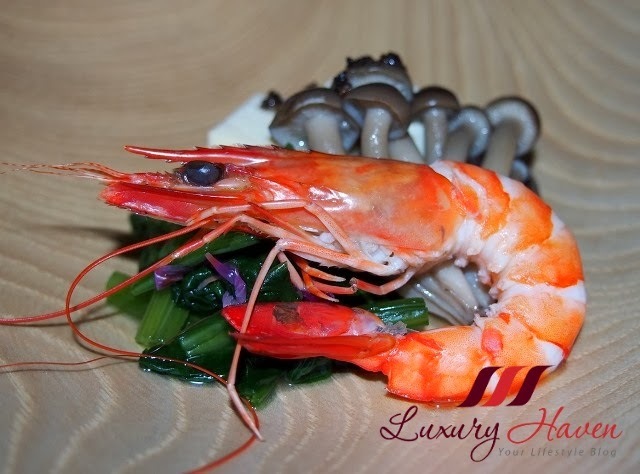 Kylie, than you'll certainly enjoy the food at Hashi Japanese! you know this shade of green looks lovely on you........I really like the photos you took of food...and I must say this japanese reastaurant looks like the place to dine!